The NES defined a generation. The 3DO? Yeah, not so much. Some consoles achieve great things, selling millions of units and reaching people who have never played games before. Sadly, some consoles are cursed with much less appealing fates, destined to languish in obscurity, forgotten by all but a few, faithful stalwarts. 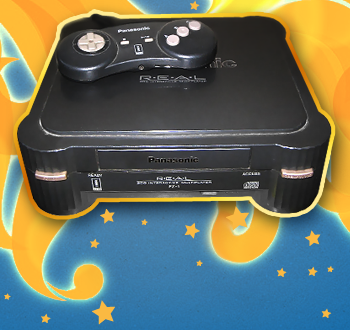 In Issue 292 of The Escapist, Susan Arendt reminisces about the 3DO, an expensive and underwhelming console that is firmly in the "languish" category, but still occupies a very special place in her heart. I saw PC gaming as the pinnacle of videogame brilliance; that I couldn't participate in it was slowly driving me insane. The ads for The 11th Hour taunted me. The box on the shelf mocked me. And then ... salvation! I read that The 11th Hour would be coming to the 3DO, the disc-based gaming console that was so high-tech it practically came from the future. Looking back, I'm somewhat aghast by what a complete idiot I was about the whole thing ... At the time, however, my decision made all the sense in the world, and I was happily mesmerized by the 3DO. It was hilariously simple in design, just an ugly square with rounded corners and two chunky buttons on the front, but nevertheless I cooed with glee every time the Cylon-esque power indicator on the 3DO's front lit up. The 11th Hour actually wasn't due out for some time, so I began to investigate the long, narrow boxes that made 3DO games easy to spot on store shelves ... Here, surely, was the future of gaming! Real-life actors starring as game characters! Amazing sound quality! Mature themes that couldn't possibly be explored on kiddie machines like a Genesis or SNES! My possession of a 3DO had guaranteed my place among the gaming elite.